will be the annihilation of the Jews. 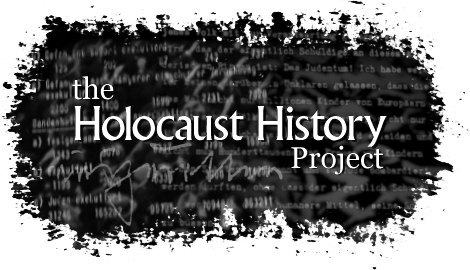 The Holocaust History Project is a free archive of documents, photographs, recordings, videos and essays regarding the Holocaust, including direct refutation of Holocaust-denial. a Quicktime movie presentation, text and audio. contributions on various topics from THHP members. Are the Jews central to the Holocaust? (1500 words) by Gordon McFee. The Bolshevik Canard (1800 words), by Richard J. Green. The Dachau Gas Chambers (5000 words, 47 photos), by Harry W. Mazal OBE. December 12, 1941 (2000 words), by Götz Aly (translation by Gord McFee). Final Destination Treblinka (11,400 words), by Stephen Potyondi. The Forensic Sins of Carlos Porter (6000 words), by Yale Edeiken. The Führer Myth (15,000 words), by Stig Hornshøj-Møller. General Semantics and Holocaust Denial (4800 words), by Andrew E. Mathis, Ph.D. The IHR at the Crossroads (4,000 words), by Yale Edeiken. In the Nazis' Words (2500 words), collected by Gord McFee. An Introduction to the Einsatzgruppen (6000 words), by Yale Edeiken. Irving's War (8000 words), by Yale Edeiken. Stroop on Treblinka (1200 words), by Jamie McCarthy. When Did Hitler Decide On The Final Solution? (2000 words), by Gord McFee. Where Did David Irving Go Wrong (5000 words), by Gord McFee. Why "Revisionism" Isn't (1500 words), by Gord McFee. Body Disposal at Auschwitz: The End of Holocaust-Denial (20,000 words), by John Zimmerman. The related essay My Response to Carlo Mattogno (20,000 words), by John Zimmerman. The Chemistry of Auschwitz (8000 words), by Richard J. Green. The related essay Leuchter, Rudolf and the Iron Blues (4000 words), by Richard J. Green. The related essay Chemistry is Not the Science (18,000 words), by Richard J. Green and Jamie McCarthy. A related Expert Report submitted in support of Deborah Lipstadt's defense in David Irving's lawsuit against her. An essay Gisella Perl: Angel and Abortionist in the Auschwitz Death Camp (7148 words) by Anne S. Reamey. How Reliable are the Höss Memoirs? (5000 words), by John Zimmerman. The Controversy around Fritjof Meyer's article in Osteuropa , a series of articles and essays addressing the death toll in Auschwitz-Birkenau, by Albrecht Kolthoff, in German, with English translations. John Ball: Air Photo Expert? (3000 words), by Jamie McCarthy. The "Wolzek" Paradox (2000 words), by Jamie McCarthy. Zyklon Introduction Columns (2000 words), by Jamie McCarthy and Mark Van Alstine. The �Disappearance� of SS-Hauptscharf�hrer Lorenz Hackenholt by Michael Tregenza. Uprising in Treblinka by Samuel Rajzman. Please also see our section on Eyewitness Accounts and Family Histories for a sense of the human impact of the Holocaust through the eyes of those who experienced it or know people who did. documentary evidence from the past. March 26, 1942: "Special Vans...or Other Remedies". Letter from Rauff to the Criminal Technical Institute, stating that "special vans" are needed at the Mauthausen concentration camp. Until they arrive, bottled poison gas must be used. quote marks in the original - will be used to clear out a camp of Jewish women and children. June 5, 1942: "97,000 have been processed". Letter to Rauff, describing in detail how the "special vans" in the East have murdered 97,000 people. August 21, 1942: "Bathing Installations for Special Action". Describes two ovens installed in Auschwitz gassing bunkers. August 26, 1942: "Material for Special Treatment". Permission to send a truck to pick up Zyklon-B. September 1-5, 1942: Diary of Johann Paul Kremer. Dr. Kremer witnessed gassings in Auschwitz and wrote about them in his diary. September 8, 1942: "Cremation capacity of 2,650 a day is not enough". A note to file by Topf engineer Karl Prüfer. January 29, 1943: "Cremation with Simultaneous Special Treatment". It was important to conduct gassing and cremation at the same time. January 29, 1943: "Vergasungskeller". The gas chamber room's purpose is revealed ("gassing cellar"). March 31, 1943: Krema II Inventory. Mentions the devices by which the Zyklon-B was poured into the gas chamber. June 24, 1943: Krema III Inventory. Lists the fourteen (fake) showerheads and "one gas-tight door" installed in the gas chamber. May 24, 1944: "Unconditional Secrecy". An SS man is sworn to secrecy "to carry out the Jewish evacuation." June/July 1944: "Revealing a State Secret". A woman is executed for having revealed Auschwitz's secrets. July 18, 1942: "the obligation to maintain secrecy continues even after I have left the Service" A secrecy undertaking of Operation Reinhard participants. Cremation at Gusen: A Timesheet. Shows the cremation of 94 corpses in less than 20 hours on November 7, 1941. Leuchter Consent Agreement. Holocaust Denier Fred Leuchter admits he is not an engineer and nevertheless represented himself as such. scanned or typed reproductions of works. Auschwitz: Technique and Operation of the Gas Chambers by Jean-Claude Pressac. The seminal and still timely book on the gas chambers at Auschwitz. French Children of the Holocaust by Serge Klarsfeld. It is a heart-wrenching depiction of the cruel treatment that the Nazis inflicted on innocent French Children. The Holocaust and the Neo-Nazi Mythomania by Serge Klarsfeld. 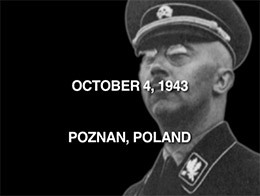 The Holocaust and Neo-Nazi Mythomania is a documentary work which consists of two studies � "The Launching of the Final Solution of the Jewish Question" and "Reply to the Neo-Nazi Falsification of Historical Facts Concerning the Holocaust." The Struthof Album by Jean-Claude Pressac. It is a study of the Gassing at Natzweiler-Struthof of 86 Jews whose bodies were to constitute a collection of skeletons. Wherever They May Be by Beate Klarsfeld. The autobiography of a young German girl who grew up to become one of the premier Nazi hunters. IMT Volume I (370 pages). The Trial of the Major War Criminals Before the International Military Tribunal at Nuremberg, Volume I. Covering October 18 to November 13, 1945. The text has been faithfully reproduced page-by-page. Thanks to Patrick Groff and Harry Mazal. IMT Volume II (500 pages). Covering November 14 to November 30, 1945. Thanks to Patrick Groff and Harry Mazal. IMT Volume III (600 pages). Covering December 1 to December 14, 1945. Thanks to Patrick Groff and Harry Mazal. IMT Volume IV (570 pages). Covering December 17, 1945 to January 8, 1946. Thanks to Patrick Groff and Harry Mazal. The Jaeger Report (9 pages), Written by SS-Standartenfuehrer (Colonel) Karl Jaeger, commander of one of the "Einsatzkommandos" (EK 3), it provides a very detailed account of the murderous rampage of this "special squad" in Nazi-occupied USSR, and proudly documents 137,346 murders. The Nazi Doctors: Medical Killing and the Psychology of Genocide by Dr. Robert Jay Lifton. "An agonizing account of what doctors can do when they are transformed by their culture. To read of the medical experiments at Auschwitz - 'They took us because they didn�t have rabbits' - will make it harder for us physicians ever again to be corrupted." Howard M. Spiro, M.D. Professor of Medicine, Yale Medical School. The Stroop Report (125 pages), Major General Jürgen Stroop, 1943. The thorough Nazi record proudly documenting the destruction of the Warsaw Ghetto. See also Stroop on Treblinka. Thanks to Jürgen Langowski. See introduction for notes on the English translation. Die Einsatzfähigkeit der Blausäure-Durchgasung bei tiefen Temperaturen (5 pages), Gerhard Peters and W. Rasch, 1941. "The Efficiency of Prussic Acid Fumigation at Low Temperatures." Addresses behavior of Zyklon-B at low temperatures. Nochmals: Die Einsatzfähigkeit der Blausäure-Durchgasung bei tiefen Temperaturen (3 pages), R. Irmscher, 1942. "Once More: The Efficiency of Prussic Acid Fumigation at Low Temperatures." Further German research addressing the behavior of Zyklon-B at low temperatures. We have a special page devoted to an examination of Holocaust denial and deniers. Among other things, we offer a quick questions and answers page on revisionism and Holocaust deniers. David Irving is a Holocaust denier residing in the UK who recently lost a lawsuit to Deborah Lipstadt. We now have an index organizing material about David Irving. We also offer a pamphlet for those seeking a printed concise introduction to David Irving and his lies, entitled Who is David Irving? CODOH (the so-called committee for open discussion of the Holocaust story) is one of the major disseminators of denial in the US. We now have a webpage devoted to addressing the challenge that they pose. We have a letter from Joel Hayward regarding his change of views with respect to his Master's thesis. Early in 2009, the Vatican rehabilitated four Bishops who had been consecrated by Archbishop Marcel Lefebvre 20 years ago. Since this had been done without Vatican approval, the Bishops were excommunicated. Not long after the rehabilitation had been announced by Pope Benedict XVI, it came to light that one of the Bishops - Richard Williamson - has expressed views consistent with those of Holocaust deniers and antisemites in a television interview aired just days before the Vatican decision was announced. A firestorm of controversy arose, which has been documented in the media, and need not be repeated here. The Bishop was ordered to recant his views (which he has yet to do). THHP member Harry W. Mazal has written a Response to statements made by Bishop Richard Williamson concerning the Holocaust from both the historical and scientific perspectives of Bishop Williamson's public statements. We have a page on the team who puts this site together. Our search engine indexes the entire site. You are cordially invited to sign our guest book. We maintain a selected list of links to other sites. If you are interested in making a donation, please see our information regarding donations. Copyright © 1998-2003 The Holocaust History Project. All rights reserved.